One tumor-associated antigen that has garnered much attention as an attractive therapeutic target is glycoprotein nonmetastatic melanoma protein B (GPNMB). GPNMB overexpression has been documented in multiple solid tumor types where it has been linked to pro-migratory, pro-invasive, and pro-angiogenic phenotypes, including triple negative (HER2-, PR-, ER-) metastatic breast cancer (TNBC). Like many other tumor-associated antigens, GPNMB is expressed by normal cells and plays a role in the physiology of immune and central nervous systems. While GPNMB is expressed at low levels in normal cells, it is expressed at aberrantly high levels on the surface of tumor cells. This positions GPNMB as a potential predictive biomarker (1) and an interesting target to be exploited by antibody-based therapeutics. There are different types of monoclonal antibodies being used in the clinic today. Unconjugated or naked therapeutic monoclonal antibodies do not have any radioactive material or drugs attached to them, and are designed to selectively recognize antigens on cancer cells. They are able to disrupt pathological processes, in part, by depleting target cells through multiple immune-mediated mechanisms such as antibody-dependent cellular cytotoxicity and complement-dependent cytotoxicity. The therapeutic potency of naked antibodies has, for the most part, failed to live up to expectations in the clinic. As a result, much effort has been directed toward engineering novel therapeutic monoclonal antibodies with distinct mechanisms of action. Conjugated monoclonal antibodies linked to a chemotherapy drug or a radioactive particle form a unique class of immunotherapeutic agents known as antibody drug conjugates (ADCs). The ADCs synergistically combine the specificity of a monoclonal antibody with the potent cytotoxic effects of chemotherapy. An effective ADC delivers its cytotoxic conjugate to tumor cells that express the target antigen on their surface, while leaving normal, healthy tissue unscathed. 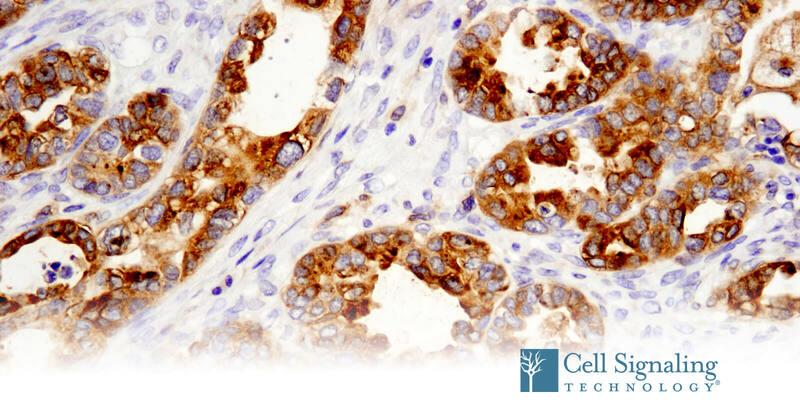 Immunohistochemical analysis of paraffin-embedded human ovarian clear cell carcinoma using GPNMB (E4D7P) XP® Rabbit mAb #3813 (For Research Use Only). The GPNMB-targeting ADC, glembatumumab vedotin (Glemba), has been commercially developed for the treatment of GPNMB-overexpressing TNBC. It is linked to the cytotoxic monomethyl auristatin E (MMAE) via an enzyme-cleavable linker designed to be stable in the bloodstream. After binding to the surface of cells expressing GPNMB, the GPNMB-ADC complex is internalized, and the MMAE linkage is cleaved, delivering the MMAE “payload” to the tumor. MMAE arrests the cell cycle by destabilizing and disrupting the microtubule cytoskeleton , similar the classic anti-tumor therapeutic vinblastine but with improved affinity and cytotoxicity (2, 3). After being granted fast track designation by the FDA, Glemba has shown a great deal of promise in the clinic as a novel single agent therapeutic option for TNBC overexpressing GPNMB, an aggressive disease for which there is no targeted therapy (3). Given the promise that Glemba holds for meeting a significant unmet need in patients with TNBC, it is now currently being evaluated in other types of solid tumors such metastatic melanoma and squamous cell lung carcinoma.